The Materials Page is where Materials are built and assigned to pixels in a Microstructure. It is the only OOF2 page (other than the Introduction Page) that does not begin with a Chooser for selecting a Microstructure, Skeleton, or Mesh. This is because Materials exist independenly of Microstructures, allowing them to be easily shared among different Microstructures. The Materials Page consists of two panes, as shown in Figure 3.8. The Property Pane is for setting the parameters for Properties. The Material Pane creates and manipulates Materials and assigns them to pixels in a Microstructure. Most of the Property Pane is occupied by a hierarchical list of Properties. This includes the predefined unnamed Properties, and the user-defined named Properties. In Figure 3.8 the highlighted Property named “goo” is a named isotropic elasticity Property. It appears in the hierarchy below its unnamed parent, Isotropic, which appears below its parent, Elasticity, which is below the top level category, Mechanical. Clicking on a Property in the list selects it for further operations. Double-clicking a Property is the same as single-clicking it and pressing the Parametrize button. 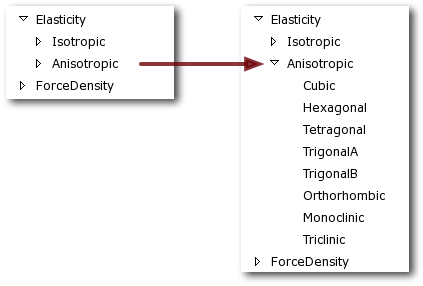 Names in the list that correspond to hierarchy levels but not to Properties (such as “Elasticity” or “Anisotropic”) cannot be selected. Clicking on the triangles to the left of the property names collapses and expands levels of the hierarchy. Figure 3.9 shows two views of the same section of the list. The anisotropic elastic property hierarchy is collapsed on the left and expanded on the right. The three buttons above the Property List make changes to the list. The Copy button creates a named copy of the Property currently selected in the list. The currently selected Property can be either named or unnamed. The button brings up a dialog box for naming the copied Property. 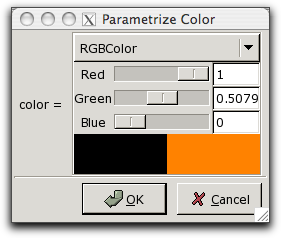 The Parametrize button brings up a dialog box for setting the parameters of the currently selected Property. Property parametrization dialogs are discussed in below. The parameters are assigned to the Property when the OK button is pressed in the dialog box. The Delete button deletes the selected Property. It can only be applied to named Properties. The predefined unnamed Properties cannot be deleted. Below the Property list is the Add Property to Material button, which adds the currently selected Property to the Material that is currently selected in the Material Pane. One Property can be added to more than one Material. Clicking the Parametrize button or double-clicking on a Property in the Property List brings up a dialog box for setting the parameters of the chosen Property. Property dialogs have a couple of notable features. Many properties contain a number of related parameters. Only the independent ones can be set, but it can be convenient to see all of them. 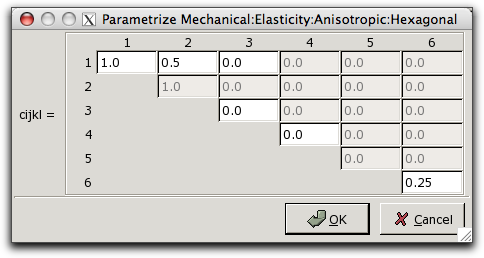 For example, Figure 3.10 shows the dialog box for the hexagonal elasticity property, whose parameter is a HexagonalRank4TensorCij object. The dialog box has entries for each of the components of the tensor. Some of the entries are grayed out, meaning that they cannot be set. Some of these (such as C14) are always zero for this Property, and some (such as C22) are constrained to be equal to another entry (C11, in this case). Changing the value of C11 will also change the value of C22. Hexagonal rank 4 tensors have only 5 independent entries, but the dialog box contains 6 active entry fields. This is because there is a non-trivial relationship between values (in this case, C66=(C11-C12)/2). Changing the value of any one of the related entries will change the value of the others so that the constraint is always satisfied. Sometimes there can be more than one way to specify a Property. For example, isotropic elasticity can be specified in terms of the components of the elastic modulus tensor, or by giving the bulk and shear moduli, or in Lamé coefficients. The dialog boxes contain a pull-down menu for selecting the preferred representation for such parameters. Figure 3.11 illustrates this for the Color Property. Other Properties that have multiple representations include isotropic elasticity, cubic elasticity, and orientation. Switching to a different representation with the menu. 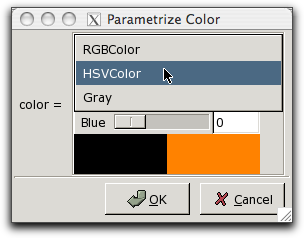 The color hasn't changed, but the sliders for setting it now use the HSVColor representation. 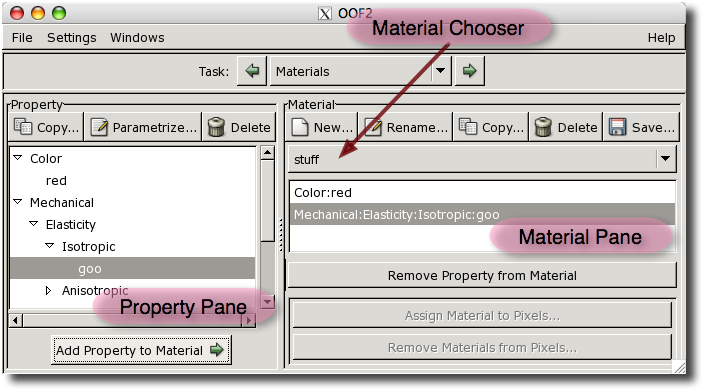 The Material Pane is where Properties constructed in the Property Pane are assembled into Materials. Materials in OOF2 are simply lists of Properties. The Material Pane consists of three regions (see Figure 3.8): a set of buttons at the top, a Material Chooser and a list of Properties in the middle, and another set of buttons at the bottom. The Material Chooser is used to select one of the existing Materials. The Properties contained in the selected Material are listed below the Chooser. Clicking on a Property in the list selects it, and also selects it in the Property List in the Property Pane. The New button creates a new Material. It brings up a dialog box asking for a name for the Material. After a Material is created, it will be automatically selected in the Material Chooser. The Copy button makes a copy of the Material currently selected in the Material Chooser. The Delete button deletes the Material currently selected in the Material Chooser. It does not delete the Properties that were in the Material -- they still exist in the Property Pane and can be used in another Material. The Save button saves the currently selected Material and its Properties in a file. The Remove Property from Material removes the Property selected in the Material Pane's Property list from the current Material. It does not remove the Property from the Property Pane. The Assign Material to Pixels button assigns the currently selected Material to pixels in a Microstructure. It brings up the dialog box shown in Figure 3.12. The Material named “stuff” is being assigned to all pixels in the Microstructure named “microstructure”. The pull-down menu marked pixels allows the Material to be assigned to the selected pixels, to all the pixels, or to pixel groups (in this case, there's only one group, called “grains”). The Remove Materials from Pixels button brings up a dialog box for removing the assigned Material from specified pixels in a Microstructure. 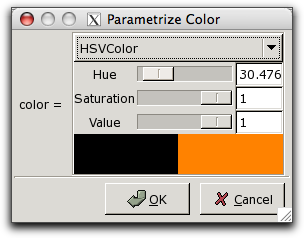 The dialog box specifies the pixels and Microstructure in pull-down menus like those in Figure 3.12. The Material assignment is removed whether or not the pixels' Material is the same as the Material Pane's currently selected Material. Interface materials have been disabled as of version 2.1. They will be re-enabled in a future release. The Assign to interface button assigns the currently selected Material to a list of selected interfaces and skeleton boundaries in a Microstructure. The Remove from interface button brings up a dialog box for removing the Material assigned to a list of interfaces and skeleton boundaries in a Microstructure. The dialog box groups the names of interfaces and skeleton boundaries that have the same material assignments.